The Students at Eindhoven University of TechnologyTU/ehave presented a solar car for 5 occupants known as Stella Vie.The team has been considering this car as a source to secure its third world title at the Bridgestone World Solar Challenge in Australia (8-16 October) where it expects to highlight the prospective of solar powered family cars. The new solar powered family car that had been unveiled recently is said to be the successor of Stella Lux and the Stella will be entered in the Bridgestone World Solar challenge in Australia later this year according to the announcement on the website of the university by TU Eindhoven solar team. The most amazing fact regarding this car is that for the first time, it has been equipped to carry five occupants, instead of four and seems to be much more efficient than all the solar cars before it. The car has the potential of a range of around 1,000 kilometres on a summer’s day in Netherlands with few solar panels on its roof. As per the students, Stella Vie, a reference to daily family life is said to be `the car of the future’. Being powered by the sun, it has the tendency of reaching a speed of around 130 kilometres per hour. The car comprises of new, smart technology such as parking navigation system which tends to take account of the position of the sun while parking.The car’s smart navigation system also tends to utilise the updated V2X technology to caution the driver regarding the upcoming traffic condition, enabling a safe and a much more efficient voyage. In order to save energy still further, Stella Vie tends to gently shove the user to drive efficiently as possible by giving refined feedback via a built-in lighting system that is inclined to caution the driver by turning red if they seem to brake too fast or speed up too violently. From Eindhoven University of Technology, the team comprising of 23 students would be defending its world title in this forthcoming bi-annual, solar-powered car competition which tends to run 3,000 kilometres through the wilderness of Australia.The Eindhoven team had won the title in 2013 in the Cruiser Class with the Stella. The team would be competing in the Cruiser Class, for practical cars, where judging would be based on technical innovation, battery consumption together with the number of occupancy on board. Teams from Delft as well as Twente have been competing in the Challenger Class in the contest for the quickest solo occupant car. The Solar Team at Eindhoven have already portrayed to the world that there is a possibility of constructing an energy competent family car. The team have designed Stella Vie to slowdown an impeccable steadiness between aerodynamic and aesthetic design and is createdto be more efficient than its forerunner, the Stella Lux.The Vie tends to increase the aero- dynamicity of its earlier siblings by 9%. 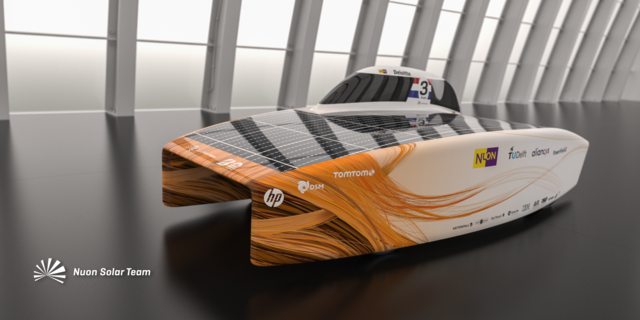 The Solar Team Eindhoven tends to make its contribution to a clean world and the main focus is to create a solar car which will be ready for the market in the future. One can imagine a world where cars would no longer require fossil fuels, a world where cars tend to be energy positive.